Sharon Pierce McCullough, a multi-disciplinary artist and sculptor, was born in Granite City, Illinois in 1943. She currently resides in the Cashtown area of Pennsylvania. Her use of vivid colors has always been one of the most striking aspects of her work, with geometrics being the most repetitive theme. 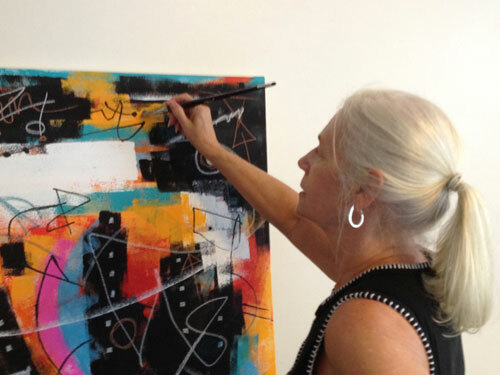 Her paintings reflect meaning relative to self, relationships and choices one makes in life. Her sculptures, reflective of her love of simplicity, make use of ordinary and recycled materials to create unique, organic pieces of art. An underlying thread of “fun” has always permeated her works. McCullough’s current body of work includes large canvas paintings and life-size sculptures. Some of her most recent sculptures combine the use of thick glass, metal, mosaics and cement to cover large armatures constructed from steel and rebar. Her definitive style continues in her sculptures with the use of bold colors of glass combined with the ordinary look of cement. There is a spontaneity to her work as she explores the relationship of positive and negative space, color and form. Her original artwork has been collected and displayed in private homes, businesses, children’s hospitals and public buildings across the country. McCullough attributes her love of whimsy and lightheartedness to the years she spent raising her five children. Her designs can be found on giftware, cards, rugs, paper products and home decor. She is also a Children’s Book Author/Illustrator. Sharon’s work is included in numerous public and private collections. Sharon started her professional career as an artist in 1992. She developed a style during her early years as an artist that is naive, yet childlike, working primarily with colored pencils. Her use of vivid colors is one of the most striking aspects of her work, with animals being the most repetitive theme. This early work, which is very recognizable, appeals to both adults and children. Many of her early works were published by the New York Graphic Society, with several images still in print. She is an author/illustrator of many Children’s Picture Books. Project: 2D Tropical Art Collage created from participating children’s art. Artist in Residence, Franklin Township Elementary School (Gettysburg School District), January 2004 Every child in the school took part in this project. Project: Life-size Paper Mache figure over a wood/ wire armature. Work History: 1986-2008, CEO/Founder, Curator of visual arts, Virginia Craft Festivals, N.VA/ DC area.